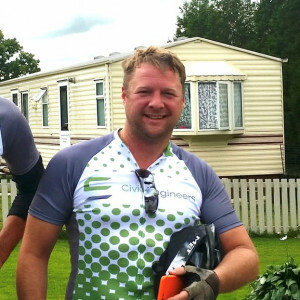 Gareth has chosen to raise funds for Club Peloton and is taking part in Legal & General Real Assets Cycle to MIPIM 2019. How would you like your donation to be displayed? Set how you want your donation to be displayed on the public SportsGiving page. Title Mr.Mrs.Ms.Miss.Dr.Prof.Rev.Mx. title is required. Email is required and must be a valid address. Country United KingdomJerseyGuernseyFranceGermanyAfghanistanÅland IslandsAlbaniaAlgeriaAmerican SamoaAndorraAngolaAnguillaAntarcticaAntigua and BarbudaArgentinaArmeniaArubaAustraliaAustriaAzerbaijanBahamasBahrainBangladeshBarbadosBelarusBelgiumBelizeBeninBermudaBhutanBolivia, Plurinational State ofBonaire, Sint Eustatius and SabaBosnia and HerzegovinaBotswanaBouvet IslandBrazilBritish Indian Ocean TerritoryBrunei DarussalamBulgariaBurkina FasoBurundiCambodiaCameroonCanadaCape VerdeCayman IslandsCentral African RepublicChadChileChinaChristmas IslandCocos (Keeling) IslandsColombiaComorosCongoCongo, the Democratic Republic of theCook IslandsCosta RicaCôte d'IvoireCroatiaCubaCuraçaoCyprusCzech RepublicDenmarkDjiboutiDominicaDominican RepublicEcuadorEgyptEl SalvadorEquatorial GuineaEritreaEstoniaEthiopiaFalkland Islands (Malvinas)Faroe IslandsFijiFinlandFrench GuianaFrench PolynesiaFrench Southern TerritoriesGabonGambiaGeorgiaGhanaGibraltarGreeceGreenlandGrenadaGuadeloupeGuamGuatemalaGuineaGuinea-BissauGuyanaHaitiHeard Island and McDonald IslandsHoly See (Vatican City State)HondurasHong KongHungaryIcelandIndiaIndonesiaIran, Islamic Republic ofIraqIrelandIsle of ManIsraelItalyJamaicaJapanJordanKazakhstanKenyaKiribatiKorea, Democratic People's Republic ofKorea, Republic ofKuwaitKyrgyzstanLao People's Democratic RepublicLatviaLebanonLesothoLiberiaLibyaLiechtensteinLithuaniaLuxembourgMacaoMacedonia, the former Yugoslav Republic ofMadagascarMalawiMalaysiaMaldivesMaliMaltaMarshall IslandsMartiniqueMauritaniaMauritiusMayotteMexicoMicronesia, Federated States ofMoldova, Republic ofMonacoMongoliaMontenegroMontserratMoroccoMozambiqueMyanmarNamibiaNauruNepalNetherlandsNew CaledoniaNew ZealandNicaraguaNigerNigeriaNiueNorfolk IslandNorthern Mariana IslandsNorwayOmanPakistanPalauPalestine, State ofPanamaPapua New GuineaParaguayPeruPhilippinesPitcairnPolandPortugalPuerto RicoQatarRéunionRomaniaRussian FederationRwandaSaint BarthélemySaint Helena, Ascension and Tristan da CunhaSaint Kitts and NevisSaint LuciaSaint Martin (French part)Saint Pierre and MiquelonSaint Vincent and the GrenadinesSamoaSan MarinoSao Tome and PrincipeSaudi ArabiaSenegalSerbiaSeychellesSierra LeoneSingaporeSint Maarten (Dutch part)SlovakiaSloveniaSolomon IslandsSomaliaSouth AfricaSouth Georgia and the South Sandwich IslandsSouth SudanSpainSri LankaSudanSurinameSvalbard and Jan MayenSwazilandSwedenSwitzerlandSyrian Arab RepublicTaiwan, Province of ChinaTajikistanTanzania, United Republic ofThailandTimor-LesteTogoTokelauTongaTrinidad and TobagoTunisiaTurkeyTurkmenistanTurks and Caicos IslandsTuvaluUgandaUkraineUnited Arab EmiratesUnited StatesUnited States Minor Outlying IslandsUruguayUzbekistanVanuatuVenezuela, Bolivarian Republic ofViet NamVirgin Islands, BritishVirgin Islands, U.S.Wallis and FutunaWestern SaharaYemenZambiaZimbabwe Country is required. GiftAid my donation* (please tick). I am a UK taxpayer and understand that if I pay less Income Tax and/or Capital Gains Tax in the current tax year than the amount of GiftAid claimed on all my donations it is my responsibility to pay any difference. This is not money collected from family, friends or work colleagues, or money raised from fundraising activities such as jumble sales, raffles, tombolas or the proceeds of any ticket sales. Please check the box to confirm you have read and agree to the donation terms and conditions. RaceNation provides online registration and fundraising for mass participation events through our platform “SportsGiving”, helping to raise vital sums of money for many good causes. On all donations we charge a small fee of up to 5% of the donation (which includes card processing charges). We do not charge a fee on any GiftAid claimed. This means that if you made a donation of £10 with GiftAid (worth £2.50), the charity would receive a minimum of £12.00. All donations made through SportsGiving are considered charitable gifts and are non-refundable. SportsGiving and its partners and charities represented reserve the right to refuse to accept any donations and to refuse to supply goods or services to any individual without explanation. When a donation is made through SportsGiving the transaction is final and not disputable unless unauthorised use of your payment card is proved. If you become aware of fraudulent use of your card, or if it is lost or stolen, you must notify your card provider and if a payment is made to SportsGiving on a stolen card, you must notify us immediately. Online transactions are subject to a small fee levied by debit and credit card companies. These third party charges do not exceed 3.0% and are included within your donation. The organisers of the event are responsible for other bank charges. You can choose what personal information is displayed when you make a donation. Use the radio buttons to select your level of privacy. Please note: The person/team/group will receive an email to let them know you made a donation. “Show all” – Your donation amount, sponsorship message and display name will be displayed. “Hide donation amount” – Your display name and sponsorship message will be displayed, but not your donation amount. “Hide your display name” – Your sponsorship message and donation amount will be displayed, but not your display name. “Hide your donation amount and name” – Both your donation amount and display name will be hidden from the public page, but your message will still show. “Hide message” – Your message will be hidden, but not your display name or donation amount. “Hide all” – This will make your donation entirely anonymous on the public page, hiding your display name, donation amount and message. "Raffle prize money from Civic Engineers Quiz Night. Thanks to Drake & Morgan, Look Mum No Hands, Bon Vino, Everyone Active and Hawkes Cidery for providing the prizes." "Fantastic cycling with you & the team. Thanks for a fun night at the quiz! " "From the Studio Fothergill Quiz team!" "From the Fletcher Priest team for your Quiz Night. Well done on a successful ride. " "Good luck Gareth! Looking forward to the quiz. Sarah Wigglesworth Architects "
"JRA / Quiz Night Congratulations on completing the epic ride across France. Chapeau! And we’ll see you at the quiz on Wednesday. John Robertson Architects "
"Looking forward to the quiz, well done on the ride!" "Well done Gareth on the ride and looking forward to the quiz - Plan A"
"The quiz is a great idea to raise extra cash Gareth. Looking forward to it." "Well done Gareth! Amazing achievement for such a nice cause! Looking forward to the quiz night!"" "Well done Gareth! Looking forward to the quiz night!" "TTPP Team Quiz Night Donation. " "Team AHMM - quiz night donation"
"Team Quantem Quiz Night Donation"
"WELL DONE GARETH FROM REC"
"Congratulations from everyone here at Land Use Consultants. " "Well done mate! Awesome achievement! " "Great work Gareth, huge respect & well done!" "Well done, now the ride to work will feel like a warm up..."
"Well done mate, good cause and great effort"
"Well done Gareth and a very worthy cause love from The Mann’s "
"Nice one bud. Well done. " "Well done Gaz!! What an amazing achievement!! Lou "
"Nice work! Storm Gareth smashed it"
"Well done Gareth from all at Bluebeam"
"Best of Luck Gareth from B&k Structures "
"WELL DONE GARETH! All the best from the Manchester office- bake sale to raise funds for your charity x"
"Good luck Gareth from Leytons!" "Good luck Gareth! What an amazing thing to do. Kat"
"GOOD LUCK G! so proud of you well done and lots of luck from Michelle x"
"Team work is great but make sure you win the sprint finish at the end!! " "Good luck Gareth and all of you taking your time to raise funds for a wonderful charity." "Good luck mate, you can do it! " "Happy birthday and good luck from the Gibson's"
"Good luck Gareth, sorry I'm not riding alongside you (this time - I hope to be back next year, if you can face that). They are right about the Sudocrem overnight...;)"
"Go get 'em Gareth! " "Hoping for a tail-wind for you all the way!" "Good luck Gareth. It will be an amazing experience." "Good luck Gareth. I hope you have an amazing time and enjoy every minute. See you on the other side! Nic"
"Best of luck Gaz. Enjoy it. It will be an awesome adventure." "Good luck Gareth - if you need to build your fitness you are welcome to use the pool you designed!" "Try and enjoy it !" "Good luck, rather you than me doing it :-) "
"Best wishes Gareth from Bhadresh and all at Buxton"
"Good luck - ignore the pain and soak in the scenery!" "Good luck! Just keep pedalling..."
"Bets of luck dude! " "Well done Gareth, very impressed youre going to take part in this challenge. Will need to hear all about it in due course!! With our best wishes. " ""Nothing compares to the simple pleasure of riding a bike” – JFK. Best of Luck!" "Good luck from everyone at Academy Consulting"
"Good luck from Geo Environmental"
"Go for it Gareth. Remember to pack the Sudocrem!" "Good luck Gareth, it'll be a breeze, enjoy every minute of it." "This is incredible Gareth. Looking forward to celebrating with you at the finishing line!" "Good effort Gareth! May your legs stay strong! " "Best of luck Gareth, great cause"
"Good Luck to you all!! From all the team at Handelsbanken Manchester"
"Good luck Gareth! I'm not jealous one bit...!" "Hi Gareth Try and enjoy the experience!! " "Good Luck Gareth, how many miles is it you're hoping to cycle? Nick "
"Good luck from Stuart Eatock and all at ECE Architecture! " "Good luck Gareth, let's hope all those roads are up to your standards!" "May the engineering force be with you!" "Good luck Gareth, keep them legs turning!" "You spend your life battling gravity!" "Give it some welly! " "Le "TGV" being "Tous avec Gareth a Velo" - Bravo "
"Good work Gareth. Keep peddling!" "Good luck Gareth. Routing for you." Club Peloton is a fundraising charity which uses cycling as its platform for challenge events, bringing together a love for the sport and the opportunity to raise money for great causes. Club Peloton will be supporting Coram’s vital programmes, with a specific focus on Coram’s unrivalled and pioneering adoption service. For more information please visit: www.coram.org.uk.